What is SeniorMoment ? With SeniorMoment you can easily journalize your daily activities (diary), organize your contacts, personal documents and more! It's a memory helper for anyone. You don't have to be older to mistrust your memory, because sometimes you just can't remember things the way you used to. It is user friendly by windows graphical conduction. An encrypted secured password is used to access important information like Diary and Privacy data. When was the last time you forgot that person's name ? phone number ? email address ? .... Or could not remember where you put that $100 for a rainy day because you hid it too secretly. Or telling yourself: "I am not among the older peoples, but I'm getting worse mixed things up." Sometimes, you kept things too secretly that you've often forgotten. 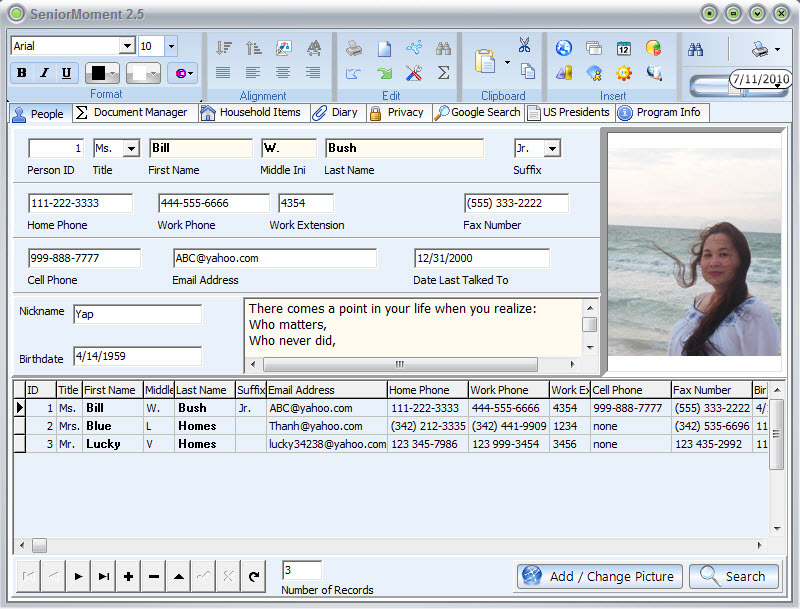 So, it is time to write down what are too important to forget, and that's what SeniorMoment is used for. It is designed to restore, compensate the deficits of memory ability. So, the next time when you are about to say: "I am having a senior moment" or "It's that senior moment just giving me a hard time again", you know that now you have a friend in your computer to refresh your memory.